The Baseball Bloggers Alliance has completed naming its 2012 award winners. As you'll recall, I made my picks right after the season finished. There were some easy choices, but I made a few controversial choices. I ignored Jim Johnson's 51 saves, and selected Fernando Rodney for top reliever. I picked Justin Verlander and his 17 wins for top pitcher while shunning 20 game winners David Price and Jered Weaver. More egregiously, I ignored Miguel Cabrera's triple crown and selected Mike Trout as player of the year. I had some very good reasons for doing so as outlined in my posts, but I expected to be in the minority. Well, I am very pleasantly surprised to see the rest of my BBA brethren (and sistren! ), selected the same award winners that I did. Below are the AL and NL winners of the Alliance, with links to their site where you can see more details on the voting. Happy offseason to all my readers. 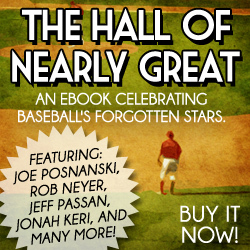 To get you through your baseball withdrawal, you can now get the great Out of The Park Baseball game for 50% off for the rest of the offseason, through this link.